In the end, the debate wasn’t even about whether or not 49-year-old Bernard Hopkins could beat 30-year-old Beibut Shumenov and unify their IBF and WBA light-heavyweight titles. The only argument left on Saturday night centered on how thoroughly Hopkins had dominated his younger opponent. Hopkins, a Philadelphia product who converted to Islam in the late-1980s, defeated Shumenov, raised Muslim in Kazakhstan, by split decision at the DC Armory in Washington, D.C. Two ringside judges scored the bout 116-111 for Hopkins, while one judge had it 114-113 for Shumenov. But according to pretty much every boxing writer in attendance and seemingly the entire Twitter/Facebook social media audience, Hopkins’ victory was indisputable. As usual, Hopkins started slow, dropping the first two rounds according to many observers. But, as usual, Hopkins seemed untouchable and unstoppable once he found his range and his rhythm. Hopkins kept Shumenov off-balance and out of his comfort zone with slick counterpunching, solid defense and his go-to arsenal of veteran mind games. Plus, he simply hit Shumenov more than Shumenov hit him. According to CompuBox, Hopkins landed 93 of the 182 power punches he threw (51 percent), while Shumenov connected on just 67 of his 332 power shots (20 percent). Hopkins put an exclamation point on his performance by knocking down Shumenov in the 11th round. With each fight, Hopkins re-writes boxing’s record books. With his win on Saturday, he — for the third time — became the oldest man to claim a world title (Shumenov’s WBA belt), the oldest to successfully defend a world title (his own IBF belt), and the oldest to unify world titles. 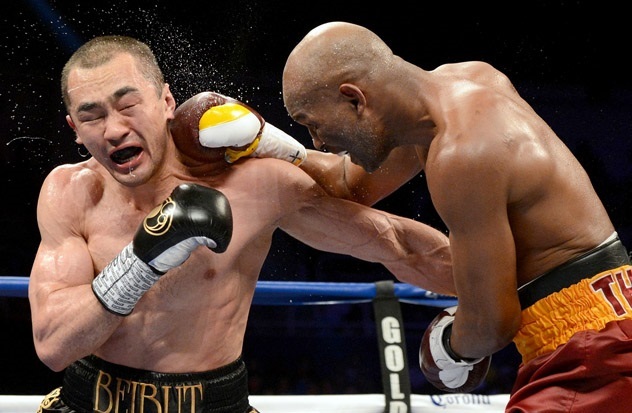 Shumenov’s record fell to 14-2 with nine knockouts. In one of Saturday’s undercard fights, Brooklyn-born Muslim welterweight Sadam Ali scored a first-round knockout against veteran challenger Michael Clark. Ali, 25, improved his professional record to 19-0 with 12 stoppages.